We are striving to bring some interesting information about the Nissan 370Z to the table even though there is a lack of it floating around on the internet or released officially by Nissan. Let us take a look at the 370Z's underpinnings through the eyes of an automotive engineer so we can do some intelligent guessing while attempting to fill in some of the blanks about the car's specifications. In this first go around of describing the 370Z's technical side, we will be doing some educated speculation but we will be interviewing some of the people behind the development of the car in the near future to get more accurate information which we will present right here at 370z.com. Thanks to Edmunds.com, we were invited to the first public viewing of the 370Z. While other Journalists busied themselves by jostling for a chance to photograph the outside, sit inside or eat the tasty burritos and tacos provided for the event, we got down and dirty, crawling on the ground to look at the underpinnings so we could try to get a more technical view of the car. We also got to look at the underside of a press fleet 370Z on a lift. Here are some of our observations. The 370Z looks to have suspension that is quite an improvement over previous iteration of the Z car, the 350Z. Under close examination the Z shares basically the same suspension as its FM (Nissan code for high performance front engine rear drive chassis) second generation chassis stable mates, the Infiniti M35/45 and the G37 Sedan and Coupe. Having seen the suspension off of these versions of the FM2 chassis, previously we can thus relate better to it on the 370Z. 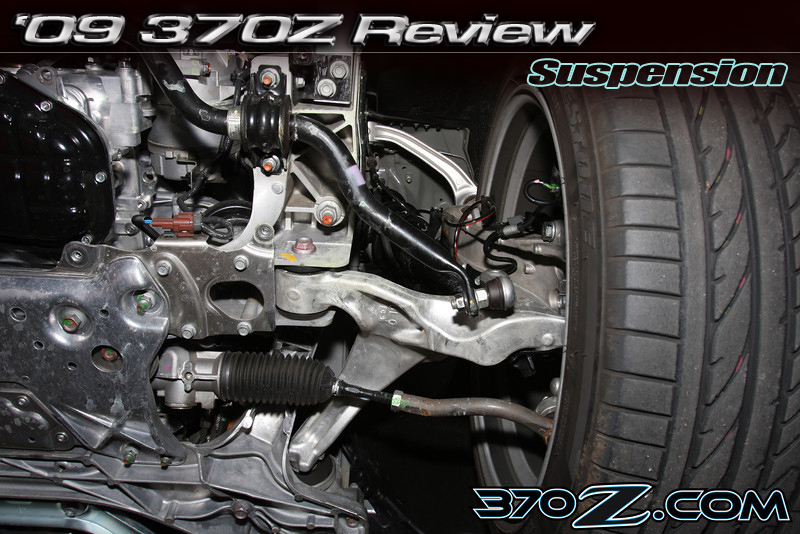 The 370Z's front suspension is elegant and straightforward. Stiff, light and strong forged aluminum is used for the upper and lower control arm. The spindle is also forged aluminum. The control arms are more parallel to the ground in the plain view than the 350Z indicating that there is less antidive in the geometry. The front suspension is greatly improved over the 350Z. It is a simple unequal length "A" arm designed with forged aluminum links, looking like a close relative of the parts on the R35 Skyline GT-R. In fact it would not surprise us at all if all of the FM2 chassis share many of the same parts. The all important suspension geometry looks to be properly done with decent lengths of the upper and lower links for reduced scrub and bump steer with a relatively aggressive negative gain camber curve to help keep the tire tread flat on the road under roll. The 370Z's front suspension and steering rack bolt to this elaborate, stiff and light aluminum subframe. The subframe bolts solidly to the chassis with no slop inducing bushings. Even the exotic GT-R gets a steel subframe! Super article ! Great summary of how the parts changed, testing results, and expectations for how that will add up on the street / track. Only request is to add some critical thinking around how to make it even better... If you were building a time attack 370z, what would need to change?! Thanks!